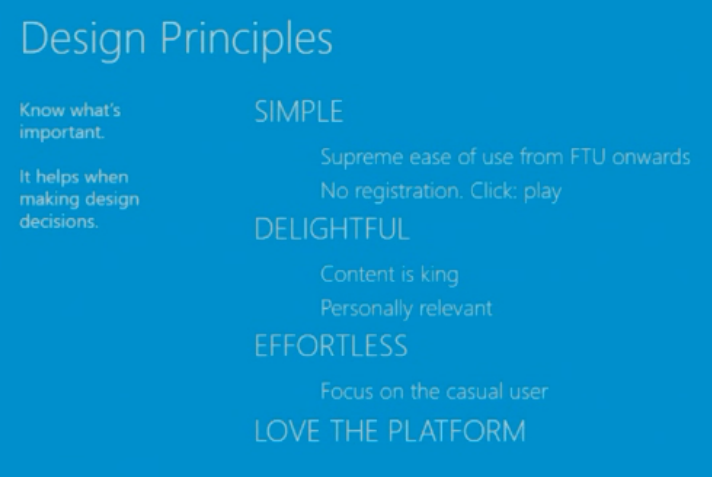 Microsoft Build 2013: Love the platform? The paradox of Microsoft: record revenue and profits, but yes, Windows 8 has been a disaster so far, and the company has lost developer and consumer mind share. That might explain why there was no lack of availability for tickets to Build in San Francisco. With a smart PR move, Microsoft “sold out” of a limited first allocation, then made more available, and you could register right up to the day before. Attendance estimates are around 4,500. The atmosphere was good though, and someone remarked to me that it felt a bit like an early Mix event, Microsoft’s web and design conference back in Silverlight days. Blue was the colour; and for me Build 2013 was a Windows 8.1 event, though attention was also given to Windows Azure and Windows Phone. Microsoft has two goals with Windows 8.1. One is to placate users who essentially want Windows 7.1 and have been wary, confused, or worse, in their reaction to the Windows 8 Modern (or Metro, or Windows Store) user interface. The other is to establish a new tablet platform, something which has yet to happen despite significant numbers of Windows 8 installations out there since the launch. There was solid progress on both these fronts at Build, though whether it was enough is of course open to debate. Windows 8.1 is a nicer experience, especially for desktop users, and the user interface feels more elegant and refined than Windows 8.0. No matter what you may have read elsewhere though, Microsoft is not backtracking. The focus at Build was on the new app platform and its improvements. Developers I spoke to were generally happy with these. “It’s caught up with Silverlight”, one told me. In practice, the developer choice tends to be C#, which dominated the session examples, and there was no more gossip about Microsoft abandoning .NET. Windows seems to be on a one-year refresh cycle now. No date has been announced, but the signs are that Windows 8.1 will follow one year after Windows 8.0, which means RTM (the release build) no later than August and machines on sale in time for the winter season. Much was already known about Windows 8.1, so were there any surprises? The main one was the evolution of Bing. The key phrase is “Bing as a platform”. 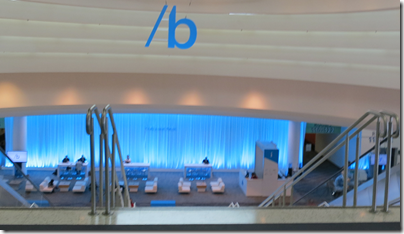 Bing is much more than just a search engine. We’re always a platform company. As we’ve been building this great search experience, we’ve actually been building this rich platform. said Program Manager David Robinson in this session. Bing services are not just search, but also speech recognition (as seen on Xbox) so that developers can create “natural user interfaces” with voice control, text to speech, and 2D and 3D mapping with driving directions. 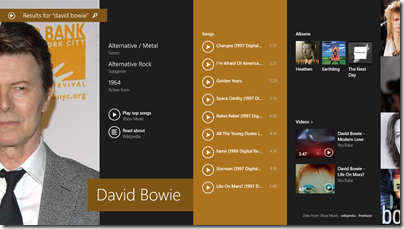 The other twist on this is the new search app in Windows 8.1. 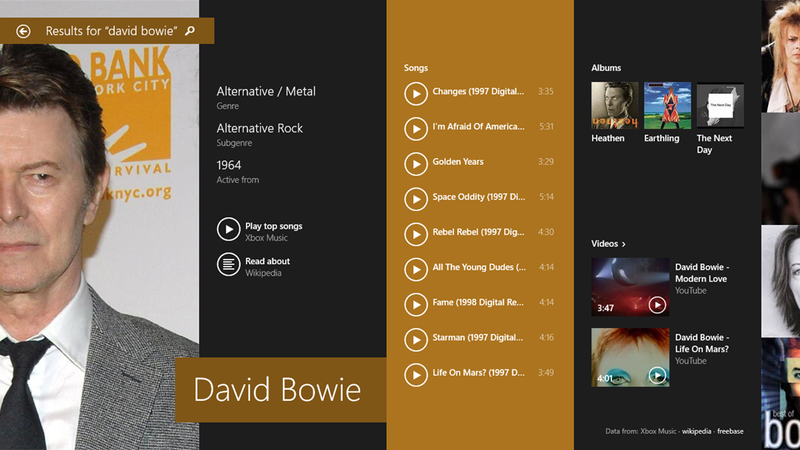 The way search works in Windows 8.1 has changed quite a bit. Search within an app should no longer rely on the Charms menu, and developers are expected to put a search box into their user interface. Search in the Charms menu is a system search, that integrates local and web results. Thus, if I search for Build, I get the Build apps, local documents mentioning Build, my own photos, web results relating to the building industry, word definitions, and so on. If I search for “Event viewer”, I get the control panel applet, a Wikipedia entry, a couple of Microsoft support articles, and then a general web search with infinite scrolling to the right. If I search for a celebrity, I get a rich multimedia view. The search engine here is not pluggable; only Bing will work. This is smart strategic thinking, since it is at once a compelling app, an easy way to navigate Windows, and a way of building search share for Bing. There are some details of search yet to be revealed. In particular, I asked how an app can integrate its own content into an “Everywhere” search, and was told it has yet to be announced (even though Windows 8.0 has a search contract that you would have thought would fit perfectly here). My own experience of Windows 8.1 is positive, though since I have little difficulty with Windows 8.0 I am not a good test case as to whether it will win over those sticking with Windows 7. The Start button is mostly cosmetic, but I suspect I will find myself right-clicking it frequently to bring up the Win-X menu, now complete with Shutdown option. Surface RT is greatly improved by the update. There is some performance gain, and the addition of Outlook to the RT desktop makes it twice as useful for businesses using Exchange or Office 365. Windows 8.1 also comes with Internet Explorer 11 with WebGL and some user interface improvements. Microsoft does feel somewhat diminished these days, thanks to the decline of the PC and its smaller area of dominance, despite its continuing healthy financials. Can the company recover any of that ground? 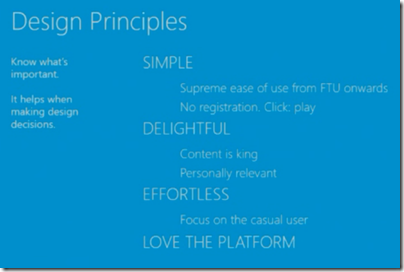 To do so it has to drive adoption of the tablet personality in Windows 8. Microsoft has made a poor start, but it may yet come together. The speakers conveyed real enthusiasm for the last of these, “Love the platform”, which is something I have not often encountered in the context of Windows 8.0, especially as the first release felt rough and not-quite-ready from a developer perspective. There is no doubting its potential though, and if Microsoft can win a bit more developer love with the 8.1 release, then we may see growth. Previous PostVirtual Reality with Oculus RiftNext PostAdobe Creative Cloud giveaway at Microsoft Build: sign of a new alliance? It’s not the first time MS have stumbled on new generation OS releases, and it won’t be the last. Personally, I have yet to find an alternative that appeal to me on the desktop – although – ChromeOS has a lot of appeal for the casual user. You should try OS X.